Motivation: Third generation sequencing methods provide longer reads than second generation methods and have distinct error characteristics. While there exist many read simulators for second generation data, there is a very limited choice for third generation data. 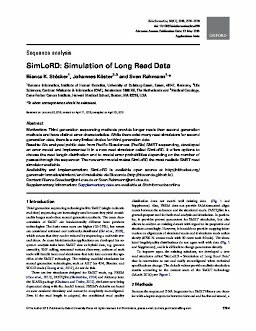 Results: We analyzed public data from Pacific Biosciences (PacBio) SMRT sequencing, developed an error model and implemented it in a new read simulator called SimLoRD. It offers options to choose the read length distribution and to model error probabilities depending on the number of passes through the sequencer. The new error model makes SimLoRD the most realistic SMRT read simulator available. Availability and Implementation: SimLoRD is available open source at http://bitbucket.org/genomeinformatics/simlord/ and installable via Bioconda (http://bioconda.github.io).